31st March 2012 – Christ the King School. Teachers, parents, children and Food4Macc volunteers descended on Christ the King school to move 10 tons of top soil from a heap in the car park to the four new raised beds built by Food4Macc in the school grounds. 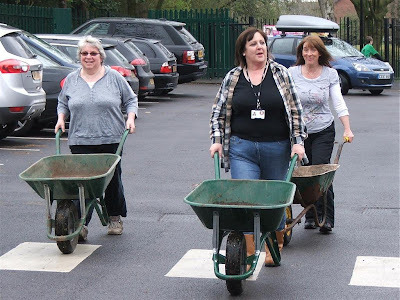 Some 15 adults and 6 children helped to man a convoy of 9 wheel barrows to move the soil and everyone worked really hard to complete the move. The school provided refreshments which were most welcome. Thanks to all who came along to help. 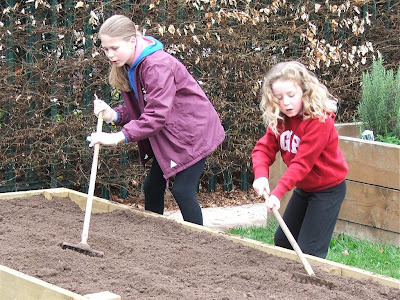 The enthusiasm of the youngsters and the teamwork of the parents taking part in the Saturday morning planting at the Heritage Walk garden, was an excellent example of how working together inspires pride in our town as well as creating a place of increasing beauty and interest. Food4Macc were joined by the Macclefield Guild, RSPB Wildlife Explorers, and Macclesfield residents and their children for a magnificent morning of achievement; and despite the intermittent scary black clouds the weather remained dry and sunshine enhanced the scene of activity. 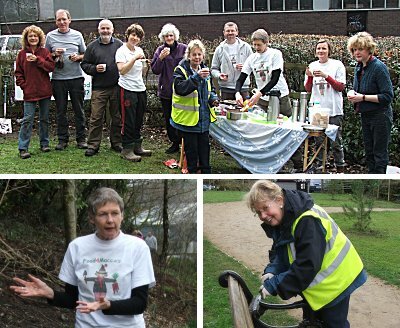 We planted a mixture of wildlife friendly trees plus bulbs, herbs and perrenials. The garden now has a terraced area for fruit with red and black currants, gooseberries and rhubarb; and a screened section for our tools and compost bin. 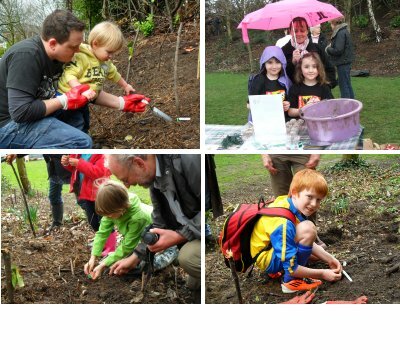 The children involved particularly enjoyed planting the wildflower 'bombs' and labelling trees with their own names. We would like to give hearty thanks to EVERYONE involved. To the volunteers who prepared the site by removing huge laurel roots; to all those who donated plants and delicious nibbles; and to everyone who helped organise and plant on the day. Special thanks to our friends on the Council team who planted the conifers and lent us equipment; the Woodland Trust, Men in Sheds and Topps Tiles for the pallets and continuing to store our steps.